The former professional skateboarder with a franchise of games sees an opening in mobile games. 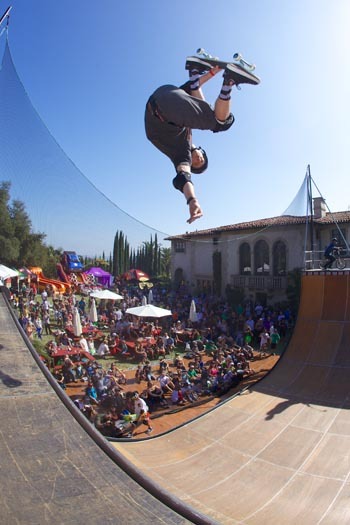 Now 45 years old, Tony Hawk has retired from professional skateboarding competitions and focuses on a skateboarding videogame series spanning 16 titles so far. His first game launched in 1999 when game consoles ruled the market. "The Birdman" has decided the time is right to take on the world of mobile gaming. "You just have to adapt and you have to realize where people are going to actually play their games," Hawk said at the Dublin Web Summit, a large technology conference. "It used to just be Nintendo and PlayStation, and now it's all kind of devices. So you've got to learn to adapt what you know from the technology into those areas... I've been wanting to do a mobile game for a long time." Hawk said "freemium" is the best model for mobile gaming right now. Games are made available to play for free, but additional content requires a fee. Hawk would make a game that asked players for money to progress to further levels. Hawk's first game, Tony Hawk's Pro Skater launched in 1999 for PlayStation. The franchise's games continued, launching on various systems such as the N64, PC, PlayStation 2, GameCube, Xbox, Xbox 360, handhelds, and more. The latest game in the franchise is an HD rerelease of Tony Hawk's Pro Skater and Pro Skater 2. There's a lot of competition out in gaming now, but Hawk said he has an advantage over competitors because of his well-known brand. "I think that we established ourselves pretty early on in our series and so people think of that as the standard for skateboarding video games."